Here is a picture of two haitian Presidents Jocelerme Privert and Michel Martelly. 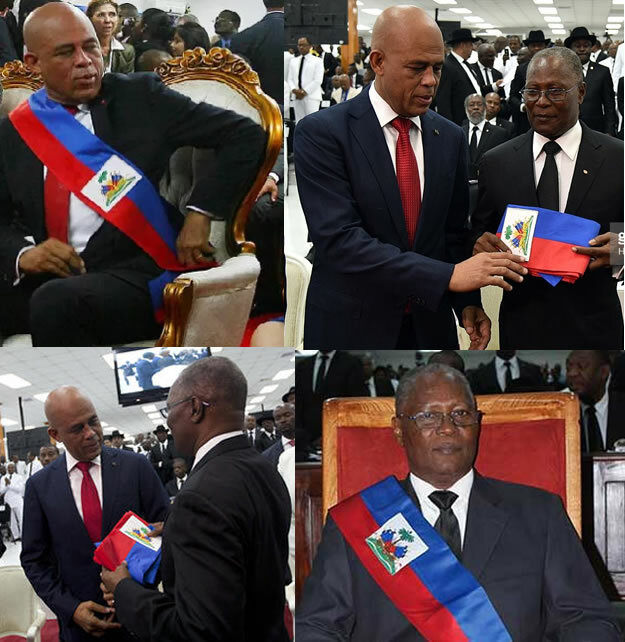 Less than 24 hours before the scheduled departure of Martelly, the Haitian leaders were able to manage and find a consensus for a short-term provisional government necessary to hold the postponed presidential and legislative runoff. However, such consensus was arrived by overruling the Haitian constitution on deals between the executive and legislature; the agreement was signed by Martelly, Privert, and the Speaker of the House and it was brokered by the OAS members. As the ruling Senate Chief, Jocelerme had also played a central role in those discussions. Recently, Privert has told the Associated Press that a new electoral council will be created soon to ensure that the postponed runoff is held within the scheduled time frame in a fair and transparent manner.